Success! Anna from Kenya raised $793 to fund ankle surgery. Anna's treatment was fully funded on June 21, 2018. 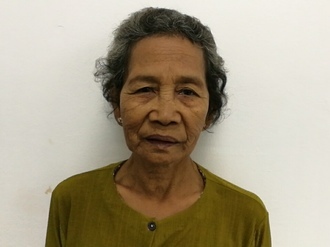 She can now walk easily and is no longer at risk of complications. Anna is a 49-year-old woman from Kenya. She is the mother of seven children, all of whom are in school. Her husband recently lost his hand in a road accident, which has taken him out of work. Recently, the family has been having difficulty earning enough money to meet their needs. In July 2015, Anna slipped and fell. Since then, she has had a dislocated ankle. She has spent three years in pain and has undergone several unsuccessful attempts to get treatment. Finally, she was referred to our medical partner’s care center. On April 9, Anna will undergo ankle fusion surgery. Now, her family needs help raising $793 to fund this procedure. Anna's case was submitted by Joan Kadagaya at African Mission Healthcare Foundation in Kenya. Anna was submitted by Joan Kadagaya, Curative Medical Support Program-Partner Representative at African Mission Healthcare Foundation, our medical partner in Kenya. Anna received treatment at AIC Kijabe Hospital. Medical partners often provide care to patients accepted by Watsi before those patients are fully funded, operating under the guarantee that the cost of care will be paid for by donors. Anna's profile was published to start raising funds. Anna's treatment was successful. Read the update. Anna's treatment was fully funded.